Let’s travel back in time and explore some pre-British Invasion American rock n’ roll. For the past few installments of this category, I have featured a good amount of late 60s psychedelic/progressive acts and I do believe it is necessary to diversify. It is difficult for many who did not live during the 60s (or are familiar with the decade’s music) to believe that there was popular American music in the decade prior to the Beatles and the Rolling Stones. The “British Invasion” is known to have started in 1964 (even though you can put that date two years earlier when The Tornados had a huge hit in the US with “Telstar – let’s just keep it at 1964). There was a solid four years of rock n’ roll prior to this date. The music was heavily influenced by 50’s rock n’ roll – poppy, bubbly, danceable, melodious. It’s fun, innocent, and clean-cut music. The musicians fit the bill as well. I think there is a charm to early 60’s music and I enjoy listening to vocalists sing about love, dating, and loss (there was a brief obsession with death pop – we will get into that another time). One such band that had success during this time was New Mexico’s The Fireballs, and their lead singer Jimmy Gilmer. A lot of people just went, “OH! I remember this song.” Not surprising. This was a HUGE hit in 1963. Before we delve into Gilmer’s stylings, let’s look a bit at the band’s history. Like I said, they originated in New Mexico. George Tomsco (lead guitar), Chuck Tharp (vocals), Stan Lark (bass), Eric Budd (drums), and Dan Trammell (rhythm guitar), formed an instrumental band in the late 50s. They recorded and released a few semi-popular hits. 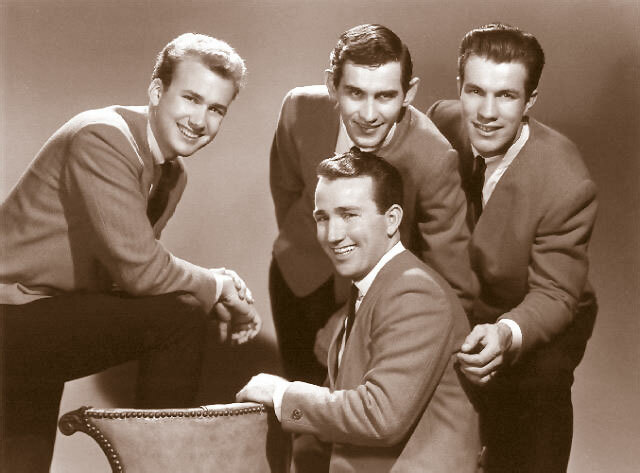 After Budd, Trammell, and Tharp left the group in the early 1960s, the group added Doug Roberts on drums and vocalist Jimmy Gilmer, a Texas-raised singer. “Sugar Shack” is your classic ditty. It comes and goes with precision. The light-hearted keyboard riff is infectious and Gilmer’s voice, featuring a little Buddy Holly twang (Holly recorded in the same studio as the Fireballs, by the way), works well in the song. Before I leave you, here is another song by the Fireballs from 1960. Notice the laid-back harmony and George Tomsco’s underrated, skillful rock n’ roll guitar. I hope it makes you smile!